Everything I've made from this book has been delicious!! I liked this! It made enough for me to take to work three times one week. Son & husband gave this 5 stars. It certainly had a fantastic aroma. Very simple to prepare. Watch your slow cooker if it runs hot as mine does--even after turning it down to the warming setting several times throughout the cooking period, the meat became slightly dried out. But it was falling-apart tender, & the juices/onions made a lovely sauce. Cheated quite a bit on this recipe: prepared on stovetop not crockpot, used tomato puree instead of diced tomatoes, no tomato paste, and added a bit of white wine. Still came up with a fragrant dish, relatively easy to fix, and quite tasty. This is a quick, simple slow cooker recipe that is satisfying & tastes good. Since there are so few ingredients, I would recommend a good quality jarred marinara for the best flavor. I used fresh mozzarella which was satisfyingly chewy. Definitely a good recipe when you are pinched for time. Last time I made this it was a hit. Not so much this time--the difference seemed to be using restaurant-style salsa which just sort of dissolved into the meat & made the mixture very watery. Definitely stick with a thick, chunky-style salsa. This dish was loved by husband and son--pork was tender, kraut was flavorful but not overpowering. Easy to prepare, put in slow cooker, and let it cook. Today, 60 percent of American households consist of only one or two people, yet most cookbooks still contain recipes designed to serve 6-8. 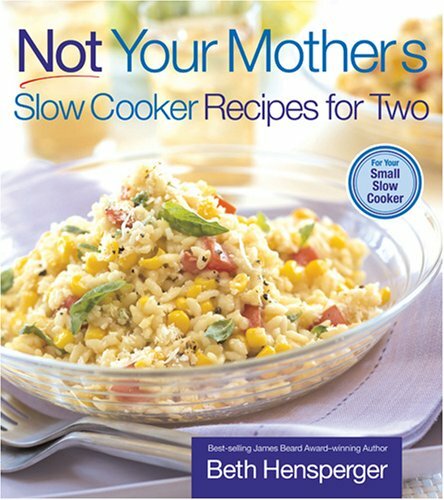 In this follow-up to the bestselling Not Your Mother's Slow Cooker Cookbook, Beth Hensperger offers 125 new recipes specifically designed for the increasingly popular 1-1/2 to 3-1/2-quart slow cooker. This is the perfect book for busy singles and small families who want the convenience of a small slow-cooker-made meal without sacrificing wholesomeness and flavor.